Being a wheelchair dependent ripple is a difficult thought as no matter what you are capable of doing, people will look down upon you as they have the freedom to come and go anywhere they want. 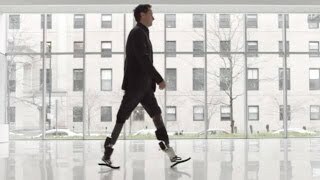 But, with the continuous development of Bionic suits, it is only a matter of time before they walk again with the help of bionic suits and remove this inferiority complex from their lives. Reddit and Wired have teamed up together to make a special video series named Cyborg Nation that will tell us about the cutting-edge developments in bionics. In the very first episode, they introduced us to Ekso Bionics and their suits for the physically challenged. The test subject was Matt Tilford and he seems happy after regaining some measure of control over his movement. The Hip and knee muscles of Tilford are paralyzed, so they are powered by neurologically controlled motors that are powered by Li-Ion batteries present at the back of the suit. However, the downside is that the guy has to use a kind of controlling crutches to navigate himself. Hopefully, the need of this will lessen with time, but it is essentially a good way to begin. One would prefer this crutches to wheelchairs any day of the week I guess! The future of these apparels is big and they will enhance human capabilities beyond recognition.